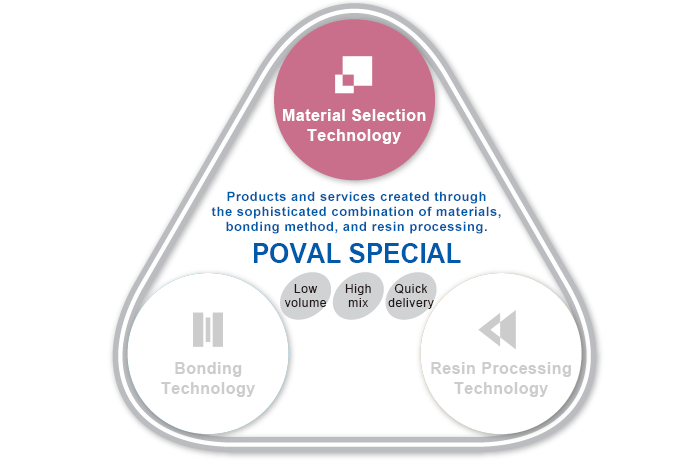 Material Selection Technology｜Main Technologies｜Our Technology｜POVAL KOGYO CO., LTD. The performance, applications, use environments, and other factors for products vary widely. We propose and select optimal materials (e.g., canvas, sheets, films, nonwoven fabrics) and turn them into products to meet customers’ diverse conditions and challenges. We select optimal materials for products from among diverse polymeric materials such as sheets, films, nonwoven fabrics, and synthetic leather. We employ technology to create the best products by combining materials with different properties.